New Delhi: Against Citizenship Amendment Bill, the whole North East region of India has staged protests. After 24-hours shutdown in Manipur, Manipuri students studying in New Delhi have started protesting this Bill. On Wednesday these students protested the controversial Citizenship Amendment Bill, at Jantar Mantar, New Delhi. During the protest students were picked up by Mandir Marg police after they burnt effigies of Central government leaders including PM Narendra Modi and Rajnath Singh in front of Parliament House. 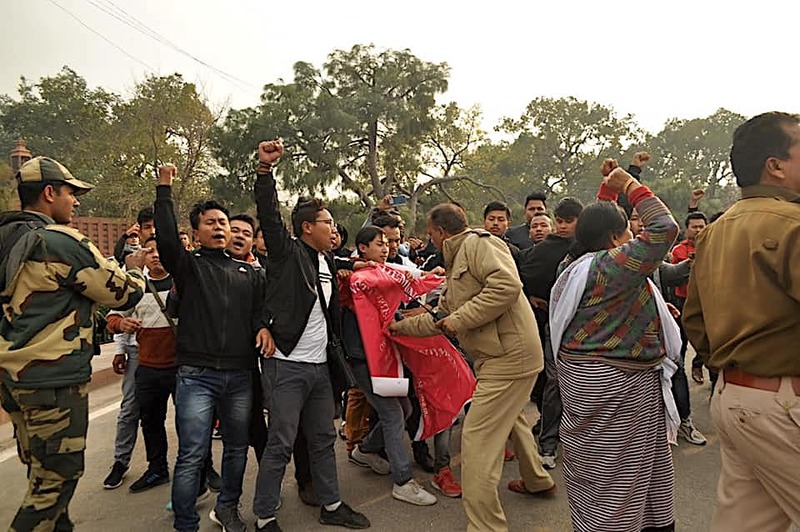 Before burning the effigies, over 130 students, who recently left Imphal to raise people’s voice against the passage of Citizenship Amendment Bill in New Delhi held a protest at Jantar Mantar. The protest was staged under the joint aegis of AMSU, MSF, DESAM, KSA, SUK and AIMS, and joined by students from various parts of North East States and members of Manipuri Students’ Association Delhi (MSAD). Student leaders taking part in the protest said that their campaign against the Bill in New Delhi will continue until the Bill is withdrawn by the BJP. With the controversial Bill, being passed from the floor of Lok Shaba by NDA led government, the whole North East states are burning with demonstrations and protests by the people of these region demanding the complete withdrawal of this bill. The diverse multi-ethnic communities are caught with the apprehension of the threatening influx of illegal migrants from the borders like what had happened in the case of Tripura where the Tripuri became the minority community in the state. The bill has been criticised for being communal and used by BJP to settle Hindus from neighbouring countries in the border regions at the cost of the natives. Through the Citizenship Amendment Bill, the government plans to change the definition of illegal migrants. The Bill, introduced in the Lok Sabha on July 15, 2016, seeks to amend the Citizenship Act, 1955 to provide citizenship to illegal migrants from Afghanistan, Bangladesh and Pakistan, who belong to Hindu, Sikh, Buddhist, Jain, Parsi or Christian extraction. The Bill also seeks to reduce the requirement of 11 years of continuous stay in the country to six years to obtain citizenship by naturalisation.